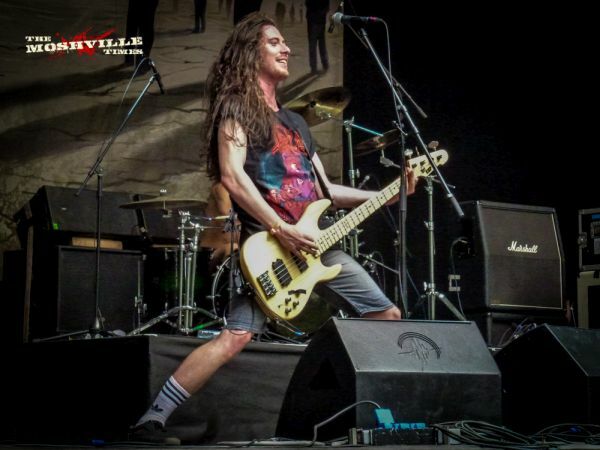 With the main stage and second stage both kicking off on the Monday, I spent a fair bit of time getting a proper feel for Metal Days and surprisingly little watching bands! The already busy venue was obviously filling up even more, and the atmosphere got even better. It’s impressive that some people had, by this point, been here for almost a week already and we’d not had a “major” band on yet. As the week proper began, this was to change with Omophagia opening the second stage at lunchtime and Moros on the main stage at half four. Around these, I decided to check out the beach area, something unique amongst metal festivals (unless you count the stop off on 70000 Tons). It’s separate from the campsites and it’s a brilliant area to chill out and splash around. The beach is a rocky one, apt really, and the water very cold but absolutely crystal clear. As well as a bar and a couple of food shops (one vegan, the other very much not so), there’s a DJ stand/stage for the partying to go on until all hours. It’s well away from the camping and also any residential areas so no chance of annoying people. There were loads of people there when I walked through, but still plenty of space for them all to have fun. The one thing I found a little annoying with the lineups is that the main and second stage bands basically play at the same time. This is alleviated slightly by the fact that you can get from one to the other in only a couple of minutes, but does mean that if you like two bands who are on at similar times, you have decisions to make. For me on most days it’s more a matter of wanting to check bands out so I’m happy to flit around and watch 20 minutes here, half an hour there. Plus people-watching is always fun at a festival with all the costumes and fancy dress! Dust Bolt brought a decent crowd for their classic thrash sounds and had fans running in circles and beating each other up with smiles of their faces. Pillorian who followed kept things going, but it was Jig-Ai who really brought the loonies out. A moshpit filled with flags and mad costumes made for entertaining visual entertainment while the band threw down their madcap grindcore tunes. “Highlights” were a surgeon clad all in green and one gentleman wearing nothing other than… erm… a willy warmer. Bands higher up the list on the main stage today included an undoubted festival highlight in Alestorm. I’ve seen this bunch several times before and they played a decent set, but what made the show probably the best by them I have ever seen, was the crowd. The main stage arena was rammed, and crowdsurfers were making their way to the front from all the way back at the sound desk – pretty impressive stuff! For those watching from the grass embankment of the press/VIP area, I’m sure this must have been a sight to behold. 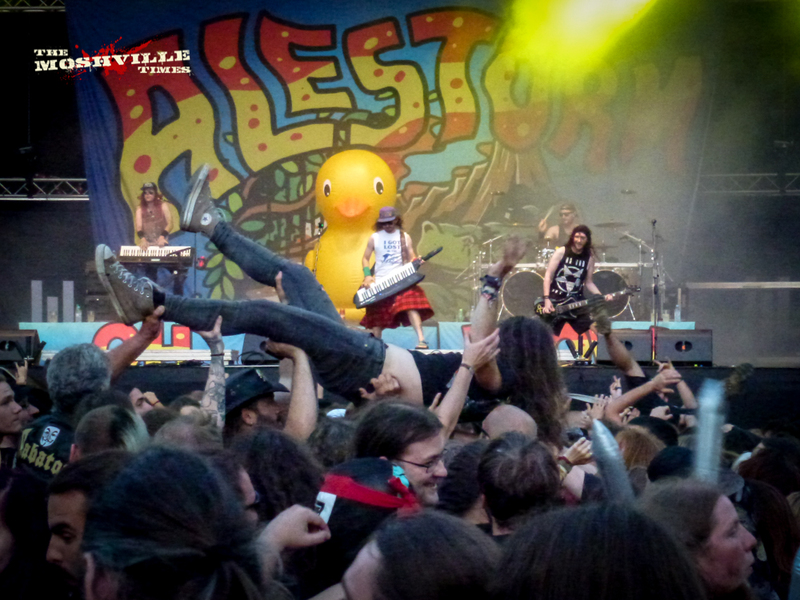 The surfers, the sitting-down-and-rowing, the huge conga line… An Alestorm audience is always going to be a fun one. The only downside was one surfer landing on my head and knackering my neck/shoulder again. Pharmacies here charge a lot for painkillers, just so you know. 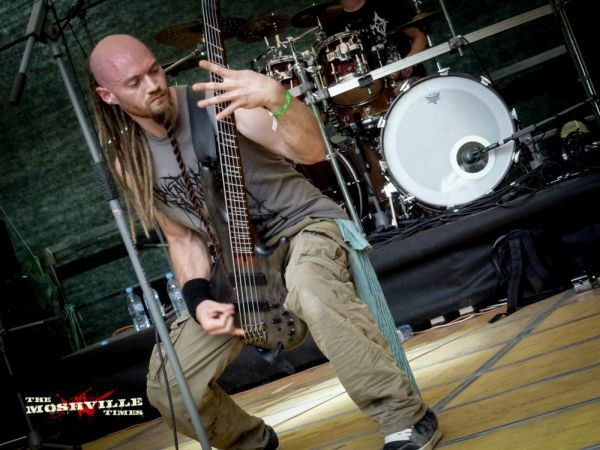 During Eluveitie I was offered “pure gin” by not one but two people in the audience. My plans of hopping over to the second stage were abandoned as we had a mini-party watching the folk metal band play a blinding set. With nine of them up there, they made full use of the stage and recent addition Fabienne Erni was a revelation on vocals. After being a little quiet on her first song, she upped her game for all that followed and simply blew me away. What a voice! Headliners Behemoth aren’t a favourite of mine – I’m not really into black metal – but I was very impressed by their show at Bloodstock two years ago, so I made sure to stay for them this time around. Sure enough, Nergal and co put on a hell of a performance with all the props, pomp and flames that we’ve come to expect. Over on the New Forces stage, which runs for a shorter length during the main festival, credit has to go to Anakim for waving the UK flag. A great performance from them must surely have netted them some new fans. I also caught Morost and Reject The Sickness there between wandering around and chatting to people, both of which enjoyable. Tuesday’s festival was a lazy one for me as I’d been for a bike ride in the morning and afternoon, so really wasn’t up to much walking around! 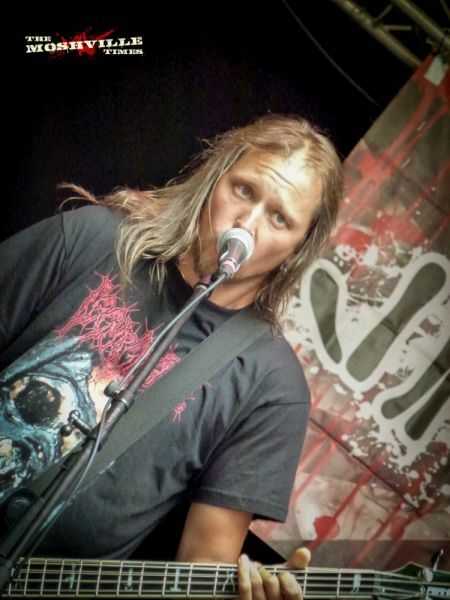 Instead I caught up with Sean from Ten Ton Slug and we spent a couple of hours trying to drain the press/VIP bar dry while watching Coroner and Ensiferum. After their superb performance a couple of days earlier, he was absolutely bouncing with the news that they will be on the main stage next year. Huge congratulations to them – they earned it!